The third Dodger to be included in Topps Living Baseball card set has just been released. 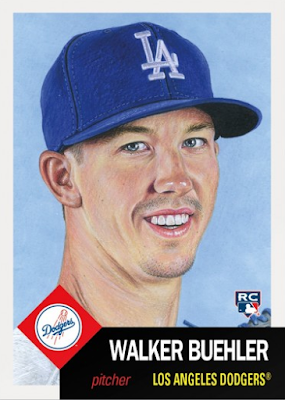 It is of rookie hurler Walker Buehler. Go here to check it out and order. It will only be available for direct online purchase from Topps over the next seven days. The two prior Dodger players already made available include Chris Taylor (link here) and Jackie Robinson (link here). Furthermore, the Taylor card sold 4,837 copies and the Robinson card sold 13,174 copies. Given the rookie status of Buehler I wouldn't be surprised if this sold more copies than the Jackie Robinson card. You can go here for a complete checklist. As you may know, this set will have no end and is not tied to any specific season or era. 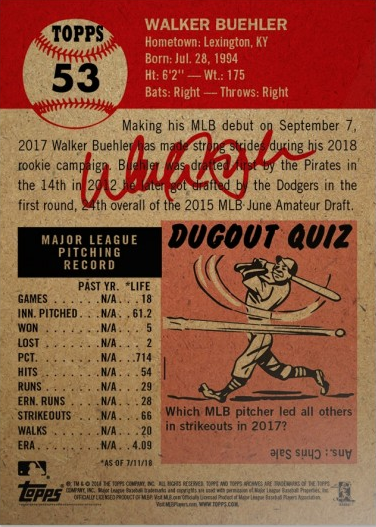 Rather, it's a cross-generational brand that will issue one card for every player using the vintage 1953 Topps Baseball design -- unless that player changes teams. In other words, this set will continue to grow in size, seemingly forever, with only one card per player/per team.